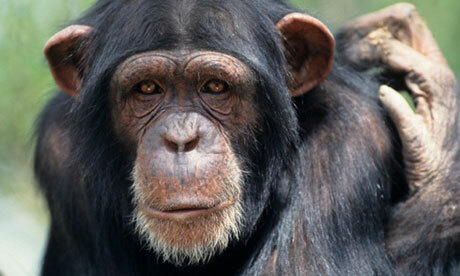 Chimpanzees and orangutans can experience a mid-life crisis just like humans, a study suggests. This is the finding from a new study, published in the Proceedings of the National Academy of Sciences of the USA, that set out to test the theory that the pattern of human well-being over a lifespan might have evolved in the common ancestors of humans and great apes. An international team of researchers, including economist Professor Andrew Oswald from the University of Warwick and psychologist Dr Alex Weiss from the University of Edinburgh, discovered that, as in humans, chimpanzee and orangutan well-being (or happiness) follows a U shape and is high in youth, falls in middle age, and rises again into old age. The authors studied 508 great apes housed in zoos and sanctuaries in the United States, Japan, Canada, Australia and Singapore. The apes' well-being was assessed by keepers, volunteers, researchers and caretakers who knew the apes well. Their happiness was scored with a series of measures adapted from human subjective well-being measures. Professor Oswald said: "We hoped to understand a famous scientific puzzle: why does human happiness follow an approximate U-shape through life? We ended up showing that it cannot be because of mortgages, marital breakup, mobile phones, or any of the other paraphernalia of modern life. Apes also have a pronounced midlife low, and they have none of those." The study is the first of its kind and the authors knew their work was likely to be unconventional. Dr Weiss said: "Based on all of the other behavioural and developmental similarities between humans, chimpanzees, and orang-utans, we predicted that there would be similarities when looking at happiness over the lifespan, too. However, one never knows how these things will turn out, so it's wonderful when they are consistent with findings from so many other areas." The team included primatologists and psychologists from Japan and the United States. In the paper the team point out that their findings do not rule out the possibility that economic events or social and cultural forces contribute part of the reason for the well-being U shape in humans. However, they highlight the need to consider evolutionary or biological explanations. For example, individuals being satisfied at stages of their life where they have fewer resources to improve their lot may be less likely to encounter situations that could be harmful to them or their families.